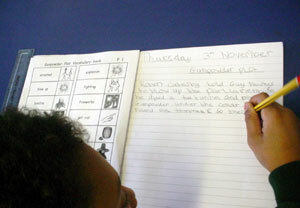 Many pupils who find learning challenging have difficulty writing. This may be related to communication, speech or confidence and self esteem issues. Students with poor working memory can also have problems thinking of and remembering what they want to write. Getting thoughts down on paper can be extremely difficult without support. Symbols can provide a visual link and reminder to make this process easier. In the example below Key Stage 2 pupils working on Guy Fawkes and the Gunpowder Plot are being supported initially by a display of symbolised vocabulary related to the topic. 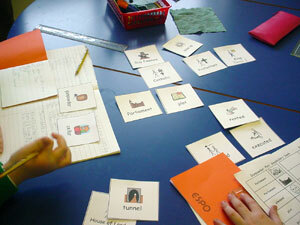 The Teacher has also made symbolised vocabulary cards and lists to make writing easier and to motivate the pupils. 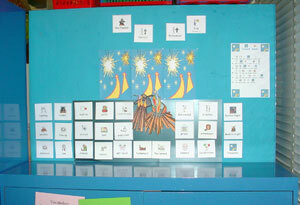 Used larger pictures to sequence and use for spelling. Writing using the vocabulary symbol list. Pupils really enjoyed using the list to spell all the tricky words. Produced work independently.